Obey them that have the rule over you, and submit yourself: for they watch for your souls, as they that must give account, that they may do it with joy, and not with grief: for that is unprofitable for you. But I beseech you the rather to do this, that I may be restored to you sooner. For the bodies of those animals, whose blood is brought into the sanctuary by the high priest for sin, are burned without the camp. Wherefore Jesus also, that He might sanctify the people with His own blood, suffered outside the gate. Let us go forth therefore unto Him without the camp, outside the camp bearing His reproach. For here we have no continuing city, we seek one that is to come. If the priest sin, let him bring for his sin, which he hath sinned, a young bullock without blemish unto the Lord for a sin offering. And he shall bring the bullock unto the door of the tabernacle of the congregation before the Lord; and shall lay his hands upon the bullock’s head, confessing his sin, and kill – slay the bullock before the Lord. And the priest that is anointed shall take of the bullock’s blood, bring it to the tabernacle of the congregation: And the priest shall dip his finger in the blood, and sprinkle of the blood seven times before the Lord, before the veil of the sanctuary. And the priest shall put some of the blood upon the horns of the altar of prayer before the Lord, which is in the tabernacle. And then he shall pour out all the rest of the blood of the bullock at the bottom of the altar of burnt offering, which is at the door of the tabernacle of the congregation. . . .
Outside the gate, outside the camp, the whole bullock burned in a place where the ashes are poured out, and this incomparable preacher who wrote this letter to the little Hebrew congregation – those sacrifices were still going on. Those sin offerings were still being made. The blood was still being poured out at the base of the altar, and the body of the sacrifice was still being burned outside the gate. And he says those sacrifices, whose blood is brought into the sanctuary and whose bodies were burned outside the camp, they are a picture of the blood of Jesus, who sanctifies us and who suffered outside the gate. "Let us go forth therefore unto Him without the camp, bearing His reproach" [Hebrews 13:13]. This is that. And the purpose of that institution in the Mosaic Levitical ritual, a thousand five hundred years before, was to portray, to signify, to picture, to adumbrate, to typify, the great sacrifice of Jesus. And he makes his appeal, "Let u, therefore go outside the camp," outside the wall, outside the gate, "unto Him, bearing His reproach." These things are so meaningful, so filled with the fullness of the revelation of God. The Lord did it there in the Old Testament that we might have a language to understand what the meaning of Christ’s sacrifice is to us today. All of the sacrifices practically were eaten as food – almost all of them. The priests and the Levites were supported by the sacrifices. They were their food, their meat, their bread. The man who offered the sacrifice himself was fed by them. They ate at the altar. The man brought his family; he brought his friends and his neighbors. And when the sacrifice was made, it was cooked there, it was boiled there, it was barbecued there, you would say. And it was shared. The inward parts were offered unto God. And all the flesh was eaten by the people. It was a shared communal meal. But there was one offering that was eaten by no one. If a man sinned – and there is not a man that sinneth not [1 Kings 8:46] – if a man sinned, he brought to the door of the congregation – he brought a bullock. And kneeling down, put his hands over the head of the bullock and confessed his sin. And then he slew the bullock at the altar of the great sacrifice. Then the priest, catching the blood in a bowl – in a basin – went into the innermost sanctuary – into the Holy Place. And there, before the veil, he sprinkled the blood seven times that a man might be right with God. And then he sprinkled the blood on the horns of the golden altar of incense, which is before the veil. No man can even pray to God or approach God apart from the blood of the sacrifice. Then he took the remainder of the blood and poured it out at the base of the great altar. All of it, all of it, a great figure of our Lord Jesus. These sacrifices portrayed different aspects and facets of the outpouring of the life of our Lord. Sometimes they brought a turtledove, and that was a sacrifice; a turtledove, a bird of mourning whose song is so forlorn, a wail of lonesomeness and despair; a man of sorrows and acquainted with grief, rejected of men, the turtledove. Sometimes they brought a lamb – or if the man was poor, a pure, white pigeon – a figure of His stainless, sinless purity, the innocent suffering for the guilty. Sometimes it was a scapegoat driven away out into the wilderness, bearing our blame away. Sometimes it was this offering, a bullock, whose blood was poured out at the base of the great, brazen altar. All of the rivers of blood of the Old Testament sacrifices flowed unto Him, and they were pictures of His sacrifice. From His face and the crown of thorns; from His hands torn with the nails, and His feet; and from the riven side, a crimson stream flowing out, and the blood fell in the dirt of the ground at the foot of the cross and made there a dark and tragic pool. Sanctified by the blood of Jesus – that’s our preaching today. When a man preaches the gospel, he preaches the blood. "God forbid," said Paul, "that I should glory, save in the cross of our Lord Jesus Christ" [Galatians 6:14]. And if you ever get to heaven, and if you listen to the angels sing and the saints sing and the hosts of glory sing, they will sing of the blood of the Son of God. And if you join in the chorus, you also will sing "Unto Him that loved us, and washed us from our sins in His own blood, to Him be glory and power and dominion forever and forever" [Revelation 1:5-6], sanctified with the blood of the Crucified One. Then he took that marvelous picture of the sin offering. And when you read Hebrews 13:11-12, it is Leviticus 4:11-12: "And the skin, and the flesh, and the head, and the body, and the viscera, and the dung," the whole animal, "even the whole bullock shall he carry forth outside the camp unto the place of ashes and burn the sacrifice with wood" [Leviticus 4:11-12]. "The bodies of those sacrifices whose blood is brought into the sanctuary are burned without the camp. Jesus also, sanctifying the people with His own blood, suffered outside the gate" [Hebrews 13:11-12]. They wouldn’t pollute their city with His body hanging on a cross. They wouldn’t condescend to have His blood defile and crimson their streets. "Take Him away! Away with Him!" they said. "Crucify Him!" [John 19:15]. Outside the Damascus gate on the road that leads to Galilee, there did they lift Him up between the earth and the sky. And He died like a common criminal – one malefactor on one side and another on the other, outside the gate. "Let us, let us therefore go forth unto Him outside the camp" [Hebrews 13:13], standing unashamed at the cross, where the great highway to Samaria and to Galilee goes by. Stand there, stand there. "Let us go forth unto Him without the gate," standing there, "bearing His reproach," counted as a disciple of the Lord, numbered among the followers of Christ to be spit upon, to be ridiculed, to be mocked, to be scorned, to be ostracized, to die. "Let us go forth unto Him outside the gate, bearing His reproach." Outside that gate with Christ is the place of rejection, of disrespect, of ridicule, and of scorn. He was born to it. When He was a babe, Herod sought to slay Him [Matthew 2:13-18]. When He came into this world, He was grouped with the animals of the stall and the beasts of the field. He was born in a stable and cradled in a manger [Luke 2:7]. When He grew up, He grew up in direst poverty. If you ever go to Palestine and visit Nazareth, you will be overwhelmed at the places where they say Jesus grew up as a carpenter’s son – in a cave, in a damp place, in a den – in direst poverty. And when He began His ministry, the leaders of His people heard Him preach. Their ire was kindled. Their bitter hatred was summoned to find counsel by which they could destroy Him! And when finally He came into their possession, into their rude, crude, rough hands, they plucked out His beard. They smote Him on the face with spittle. They covered His countenance. They pressed on His brow a crown of thorns. They put on His shoulders a cross to bear. They dragged Him outside their city. And in contempt and contemptuous contumely, they raised Him up on a hill where all could see – between two thieves! And He died like a criminal dies, on a gibbet, on a cross, on a tree, hanged like a criminal! Outside the gate with Christ, the place of rejection and ridicule and scorn – "Let us go forth unto Him outside the camp, bearing His reproach." Let us go forth. Outside with Christ, he says, is better than in the city in a palace, better than in the city with the throng, better than in the city if on the throne itself! There’s no young person who lives in our day, and in our generation, and in our time, and who listens to me tonight, that doesn’t have that thing to face outside the camp with Jesus – not in the throng with the city, not in the palace or on the ballroom floor – outside with Christ. Choosing, choosing; it’ll be a voluntary commitment, we’re not dragged out there. If we follow, it’s our choice, for the world bids us back. The world bids us in the throng. The world bids us in the palaces of evil and compromise and worldliness. Outside the gate, if you go, it’s by choice. I think of two who made that choice. Pilate made it when they said to him, "If you let this Man go, if you let this Man go, you are not Caesar’s friend, for He said, ‘I am Christ, a king’ [John 19:12]. And that’s treason. And we will take the case to Caesar, and you will be arraigned before the court of the emperor himself!" And Pilate trembled when he heard that and said, "I had rather have my place and my governor’s mansion and my palace. I’d rather have my world than to stand for God and for Christ!" And he delivered the Lord to be crucified, choosing rather the palaces of the world and the affluence of the world and the kingdom of this world. And I think of another who made a choice. And Moses chose rather to suffer affliction with the people of God, than to enjoy the palaces of the world for a season, for he had respect unto the recompense of the reward outside the camp with Jesus [Hebrews 11:24-26]. Rather be with my people, rather be with God’s folks than to be on the throne of the pharaoh and enjoy the world for a season – outside the camp with Christ. Outside the camp is a place of affliction. Jesus suffered outside the gate. "Let us go forth unto Him outside the camp, bearing His reproach" [Hebrews 13:13]. It is a place of affliction and of suffering. Those two always go together, and no man shall ever be able to disassociate them. To follow Christ and to be tried in affliction are two things that God has welded together in this world, and they always stand side by side. Our Lord Himself said: "In the world ye shall have tribulation." The old Paul, who called himself Paul the aged, writing out of a dungeon in Rome, said to his young son Timothy, "Yea, and the time has come when all who have lived godly shall suffer persecution in Christ Jesus" [2 Timothy 3:12]. Don’t think you will escape it. Don’t think you will. We are made conformable unto His death. We bear the sufferings of our Lord. If we are in this world, if our tabernacle is cast in this life, and we follow Jesus outside the camp, it is a place of affliction and trial. And you shall know it in your life. "Let us go forth unto Him outside the camp, bearing His reproach." That is the place of God’s people through all the generations, not just for a while. In the eighth chapter – the incomparable chapter 8 of the Book of Romans, Paul quotes, "As it is written, For Thy sake we are killed all the day long: we are accounted as sheep for the slaughter" [Romans 8:36]. He’s quoting Psalm 44:22. Back there, in that long ago generation, written a thousand years before the apostle Paul: "For Thy sake we are killed all the day long; we are accounted as sheep for the slaughter" [Romans 8:36]. That’s God’s Word and God’s record of God’s children through all the generations, through all time. 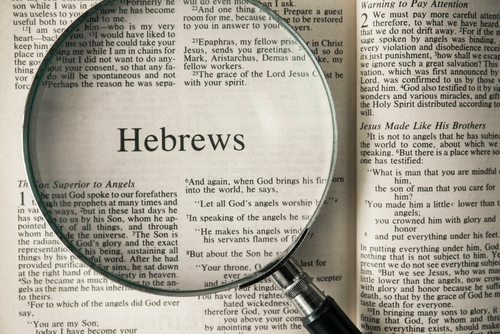 These markers that this glorious preacher to the Hebrews names – they were not two; they were not three; they were not five. He said they are a great cloud, a vast host, who laid down their lives for the faith, who were tortured and tormented, who wandered in sheepskins and goatskins and mountains and dens and caves of the earth, of whom the world was not worthy [Hebrews 11:37-38]. We don’t want His blood on our streets. We don’t want His body hanging in a gibbet in our walls – outside the camp, the place of God’s children through all the ages, and your place, if you belong to Him today. It was no more a delightful thing or an easy thing for them than it is for us. One of the remarkable things that you hardly ever notice unless somebody points it out to you is what Jesus said to Simon Peter, and what Simon Peter said to Jesus. In the twenty-first chapter of the Book of John – which is an addendum; it is an appendix. John wrote his Gospel; finished it at the twentieth chapter, and then many, many long years afterward, wrote that twenty-first chapter as a tribute to his old friend Simon Peter. And the Lord said to him, "’Simon, when thou shalt be old, another shall carry thee whither thou wouldest not.’ This signified He, by the stretching out of the hands, by what death he should glorify God" [John 21:18-19]. That is, Jesus was saying to Simon Peter, "Simon, there shall come a day in your life when they will crucify you just like they crucified Me." Tradition has it that when Peter was crucified he asked that he might be hanged on the cross with his head down, for he said, "I am not worthy to die like my Savior died." Jesus said to him, "Another shall gird thee, and carry thee whither thou wouldest not." Sacrifice and suffering and rejection and mocking and cruel ridicule and ostracism was as hurtful to them as it is to us today. Don’t ever think that these apostles and prophets and martyrs who laid down their lives as witnesses for Christ went into those awful torments without failings of heart and trembling of soul. It was an awful thing for them, as it is for you, outside the camp, suffering with Jesus. When I went to Oxford, I wanted to see that place, and stood there. When Latimer and Ridley were being burned at the stake for preaching the faith – the gospel of the Son of God – Ridley began to cry and to quail before the awful torture, burned alive. When he did so, Latimer said, "Ridley, Master Ridley, be of good cheer. Be of good cheer. Lift up your heart. Lift up your soul. By God’s grace, we’ll light a fire in England today that’ll never go out." They quailed and trembled before the ordeal, just like you, just like you. Have you ever seen the picture in the Roman Coliseum, the little band, the little church, the little group of Christians, in the middle of the arena? And there to the side, opening those great dungeons, filled with starving, ravenous, wild beasts, and the gates are opened, and those ferocious, carnivorous beasts are coming out. And the little band of Christians huddled together, in their midst the pastor, with his face raised to heaven, looking unto Jesus. Reckon why the artist drew the little band huddled together. Their hearts trembled; their souls quivered just as you would – outside the gate, suffering with Jesus. I read this week in preparing this sermon, I read a marvelous, marvelous discourse from John Calvin. He lived in the day when they were burning the heretics, when the reformation was bathed in blood! And in that address that I read, John Calvin said, "There was a young man with us, lived here with us." I do not know whether he meant by that in John Calvin’s home or just in the little community of Christians. But he said, "There was a young man who lived here with us, who recently was apprehended in Tournai." That’s a little city in Belgium. "Apprehended in Tournai, and when they seized him, they gave him the choice. If he recanted, they would cut off his head. If he persisted in the course he had chosen, they would burn him alive. And the young man replied, ‘He that will give me grace to die patiently for His name will give me grace to bear the flame.’"
I’m saying in the avowal of that unnamed martyr, that young man, he trembled, and his soul quaked, and he looked with fear and dread! "But God will give me grace to die for His name, and surely, surely, He will give me grace to bear the fire." They were afraid. They had sinking of heart. They knew the bitter, bitter taste of the dregs of suffering and death, just as you do. "Let us go forth unto Him outside the camp." It’s a place of suffering and sorrow and affliction. It is a place of separation outside the camp, outside the camp – a place of separation; in the world, but not of it. We are a different kind of people. We have a great nationality and glory. "Our citizenship is in heaven" [Philippians 3:20]. Like an ambassador in Moscow – there to do good, there to represent his people, there to do what he can to cement love and friendship, but he doesn’t belong! He’s a stranger there. His citizenship is in another land, and in another country, and across the sea. So it is with the people of God. We are pilgrimaging in the world. We are tabernacling here among men. Our citizenship is in heaven, for they say, "We have here no continuing city; we are seeking one to come" [Hebrews 13:14]. Our eyes are on glory. Our eyes are fixed upon Him – outside the gate, bearing His reproach, separated from the world. And in keeping with this incomparable picture of our Lord, it is the place of ashes. "Take the whole bullock, carry the sacrifice outside the camp, where the ashes are poured out, and burn it there. Where the ashes are poured out shall it be burnt" [Leviticus 4:12], repeats it – outside the camp, in the place of ashes, bearing His reproach. The place of ashes, our dead selves, our dead hopes, our dead dreams, all of our personal ambitions and visions of glory and self-exultation and aggrandizement – all of it burned in the place of ashes, dead to the world, that we might be alive to Christ. All of it burned – the dross, the wood, the hay, the stubble of our lives – that only the pure, golden, precious stones might remain – outside the camp, in the place of ashes – nothing of me and all of Him [1 Corinthians 3:12-15]. I read again, in preparing this message for this evening, of a man. I do not know how I missed him. I never heard of him before. He must have been a marvelous disciple of Jesus. His name was C. T. Studd, S-t-u-d-d, an Englishman of great wealth and fortune, and a young man of tremendous physique and athletic prowess. He was the greatest athlete of his day. He gave himself to Christ. He renounced his social standing. He took his fortune, and carefully gave it away, and plunged into the interior of China as a missionary. And as the years passed, when he could not take his wife and his child with him, he went again alone into the heart of Africa. And like Livingstone, he died there alone. And when they found his diary, in the last entry in the book, he had written: "O God, I have searched my life and my soul, and I have nothing else to give to Jesus." All of it, the place of ashes; his social life, his great life of wealth and affluence, his family life, his home in England, his destiny as a man of means and of the world – in affliction, and in suffering, alone, "O God, I have searched my soul and my life, and there is nothing else that I can give up for Jesus," outside the camp with Him. "Let u, therefore, go forth unto Him outside the gate, bearing His reproach." Rather be with Jesus alone than to be with the throng and the crowd on the great, broad way to death and destruction and judgment and perdition. Rather be with the people of God, singing the songs of Zion, than to be with the throngs of the world in the gaiety and the glitter of a cheap and a passing hour. Rather be with the people of God in the house of the Lord than to dwell in the richest palaces of the wicked – choosing Jesus, outside the gate with Him. And that’s the appeal we make to your heart this blessed, precious evening hour. Somebody, you – "I, too, pastor, choose Jesus, and here I come. Here I am. Whatever it may be, wherever it may lead, whatever it may cost, I follow Him." Would you tonight? "Here I am. Here I come," humbly, obediently, surrenderingly, yieldedly, "Here I am, and here I come." Somebody you to take Jesus as Savior, would you make it tonight? Somebody you to put your life with us in the fellowship of this precious church, would you make it tonight? Is there a family you who will come? All of you? "Here we are, pastor, to pray and to work by your side. Here we are." As God shall say the word, make the appeal, would you make it tonight? Somebody you, to give your heart and life in a special way to Jesus, with Him outside the gate wherever that way may lead, "Here I come, I offer my utmost, my life to Him." I cannot make the appeal. The Holy Spirit of God must speak to your heart. If He bids you come, would you make it tonight? "Here I am, pastor, here I am." Down one of these stairwells, at the front or the back, on this lower floor in the aisle and down to the front, "Here I am, preacher, here I come." On the first note of the first stanza, will you make it now? Will you make it tonight? "I will for Christ, and here I come," while we stand and while we sing.